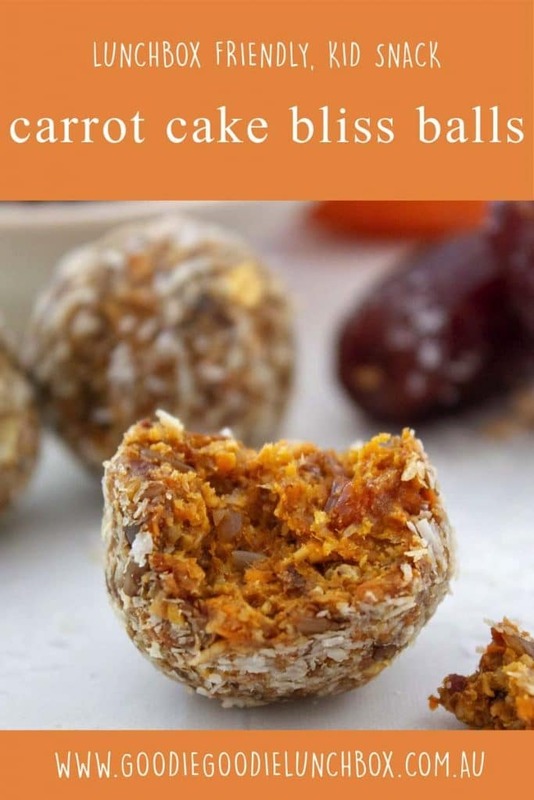 These Nut Free Carrot Cake Bliss Balls are a must make. Moist (I know, I know but how else can I describe them?) and so flavourful – honest to God I swore I was eating cake. And I am happy to report my entire family love them! 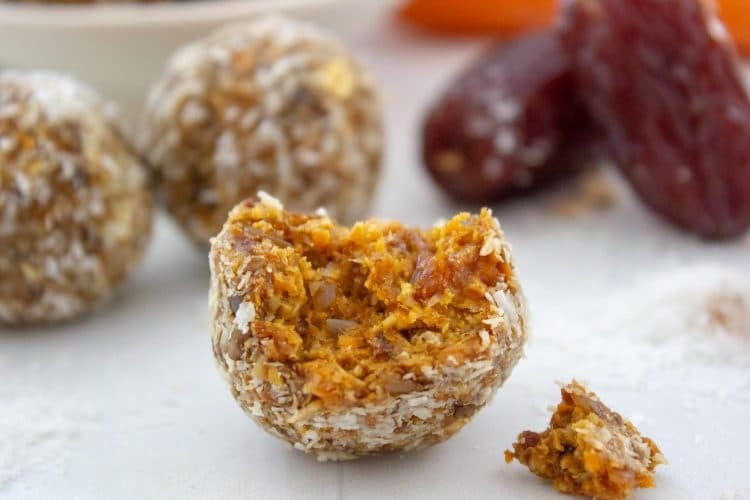 Apart from the amazing flavour, the best bit about these Carrot Cake Bliss Balls is they are nut free, so a perfect snack for daycare lunches and back to school lunches! 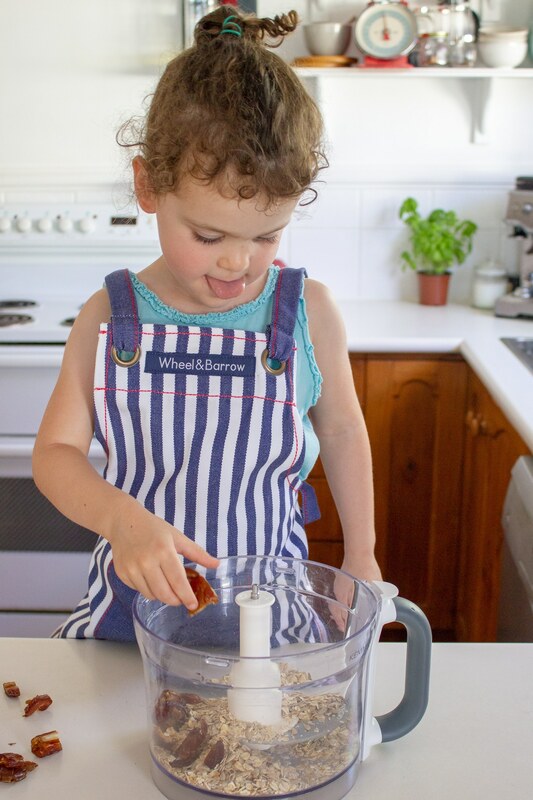 Ummm….can we all just take a minute and give all the heart eyes for Miss Three’s stick-y out-y concentration tongue! 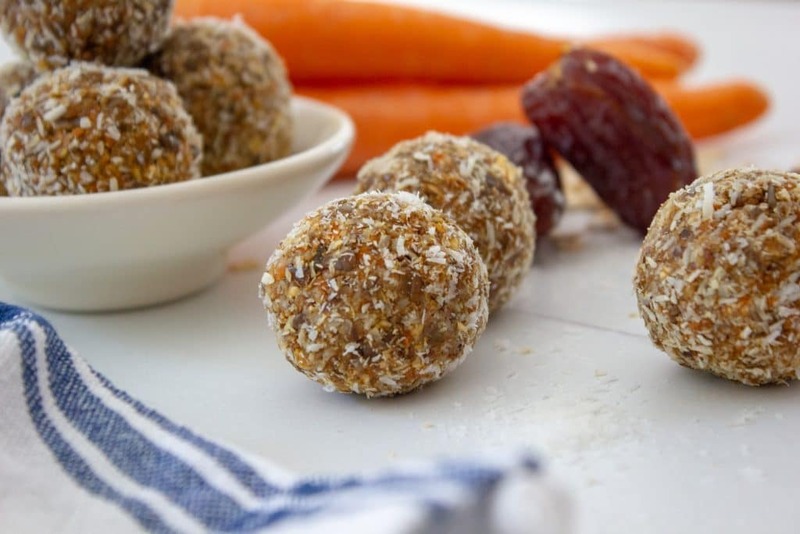 These Carrot Cake Bliss Balls come together so quickly too! It is effectively a no bake recipe though I do like to toast the oats and sunflower seeds in the oven first. I am trying to achieve a warmer, nuttier flavour by toasting the seeds and oats, but I am sure you would not need to bother with this step if you really didn’t want to. My helper Miss Three loved helping me make these and bliss balls are a really easy recipe that kids can help make with you. Miss Three added all the prepared ingredients to the food processor and of course helped turn it on – totally the best bit. 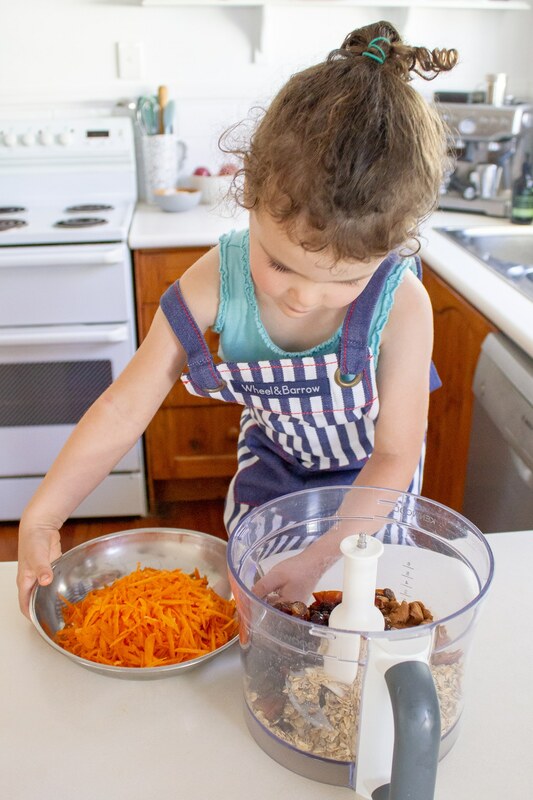 Older kids can practice more ‘dangerous’ kitchen activities such as removing the pits (or stones if you prefer) from the dates with a knife or grating the carrots. If you love carrot in baking you will love my Carrot Cake Muffins with no added sugar! Or why not try my low sugar Carrot Oat Cookies – perfect to make for school lunches. 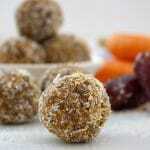 I hope you all love these Carrot Cake Bliss Balls and your kids enjoy them in their school lunches! Remember to subscribe to the blog to get my free lunchbox planner and an extensive list of ideas for what to pack in school lunches and all my recipes straight to your inbox! Hello, Rolled oats are gluten free by ingredient butNOT safe for anyone with coeliac disease as they are processed in factories that also process gluten. All oats have a ‘may contain gluten ‘statement, but you can substitute them with rice porridge which is just as good. Just made these and they were a huge hit with the family, thank you. I have some leftover and was wondering if I can store them in the freezer? I have a lil man who is severely allergic to coconut and nuts (!) – any suggestions on a substitute for rolling these in? Hi, our lunchbox goodies need to be nut and seed free – what could I substitute for the sunflower seeds? Just add extra oats? Thank you! I saw this on Instagram and I just had to make it. So good!!!! !